Office Space - Largo, Florida. Conveniently located close to downtown Largo near to West Bay Drive and to the beaches. 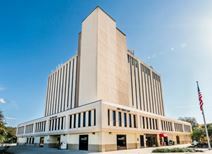 The offices are based in this 8 story building and feature the latest technology including NEC phone system technology, conference and voice mail facilities. Also includes furnished or unfurnished offices and kitchen facilities.